Granted, this game is old, but it is possibly one of the worst games I’ve played using a major Hollywood license. I posted a version of this review long in the past and now I have revised, enhanced, and re-solidified my ideas into a new package for you to enjoy. Let me say first that I have completed the Hard on Hard Mode, though I died many times. Throughout, it was at no point incomplete-able at this setting. I only played through the game once completely, though played some of the other levels individually. Initial Impressions: When I first opened the game box, I noticed that the game came on two disks. To me this felt like a major failure, as I’ll soon explain. Imagine Resident Evil 4 and its two CDs; Awesome, you get like 5+ hours of gameplay on one Disk. While playing that game, I was so surprised how long I went without having to change the disk. How about another example? Baten Kaidos. That game also came on two Disks. I can’t recall how much gameplay was on the first disk, but let me tell you, it felt long. And that game had plenty of highly compressed voice acting to fill disk space. For Goldeneye you get maybe two hours on the first disk, and everything else is pushed to the second disk. Why this is I have never figured out. Was the intro movie so uncompressed that it filled up 500 Megs on its own? Were the first 3 missions so large that the other 6 missions + multiplayer had to be pushed to a second disk? Even "James Bond: Everything or Nothing" fit onto one disk, and it had plenty of content, Great music, great Graphics etc., and was even made by the same company. The other points below pale to this two Disk fact. It bugs me, because from an economical standpoint it costs more to make, and from a player standpoint, it is annoying to switch disks, especially when so little is on that first disk. 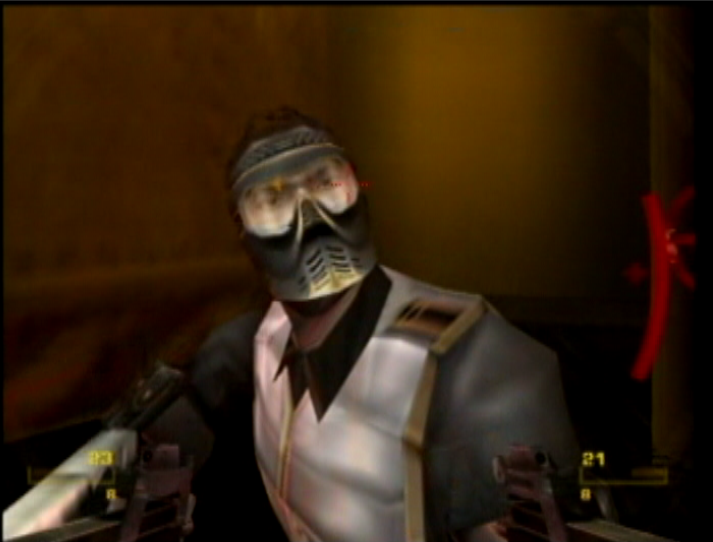 Graphics: The graphics of "Goldeneye" are bland, dull and washed out. If you get close enough to an enemy, you see the washed out look of the character’s textures. This is the kind of effect I do not want to see in a game, especially a two Disk one. The wall textures are acceptable, but the alignment of some of them is terrible. For example, after you grapple off this one building on the Tokyo level building, if you turn around and look where you grappled, you will see a giant box CUT out of the side of the building. The cutout looks huge compared to the building's proportions, and the window textures around the cutout don't even align with the cutout. Major Failure in my book. I guess you were never supposed to look back. If this game had the camera controls of Sonic Adventure games, then maybe you WOULD never see it, but this is a FPS, you can look everywhere. I will say, as a compliment, that the character models and weapons have enough polygons that they are not extremely blocky. The weapons have variety, which I’ll address later in the gameplay section. There are also a couple portions where the graphics do hit par, such as the first level, and it having a reflective floor in the last room. There are very few unique characters. There are basically two teams modeled with regular troops and elite troops that's IT. I’ll lay it out for you. Your enemies consist of. Goldfinger guard #1, Goldfinger elite guard #1, Dr. No guard #1, and Dr. No elite guard #1. You may have a boss character, but usually, it is an elite enemy variant with more powerful weapons. Wait, I lied. There are maybe 6 types. I forgot to mention there is a Tokyo mission where you fight some suited troops. The same general formula follows though: Regular troop and Elite guard. The graphics between each guard respectively are really not that different. Some may have extra goggles, but it isn’t that major. The rag doll effects on the characters don't do much either except look funky when they fall off cliffs. When combined with the grabbing and throwing of them, as I will explain later, they look odd. Thus far, have you seen where that missing space on the first disk went? Remember, that the character models would have to be included on each disk anyway, so they really aren’t saving space in that category. Gameplay: This is where the game really fails. You’re evil. OK, now that we've got that settled we'll talk about its flaws. For being so evil, you really don't do anything really evil. In fact, James Bond is more Evil then the character you play as. You kill people but so does James Bond. But wait; think about this for a moment. You never fight MI6. You never fight the CIA. You only fight either Dr. No’s guards or Goldfinger’s guards. Even for the Tokyo mission where you are hunting an assassin, you are still hunting an informant for Dr. No and his evil troopers. All these people are evil. So, as an evil person, you are hunting evil. This makes you good. James bond kills evil people, so he is good. And since you are working for an evil person, killing evil person, you are still doing the right thing morally for yourself, and so it appears good. All I see is good. Smashing people in the face doesn’t make you any more evil than any other agent if they both do it. 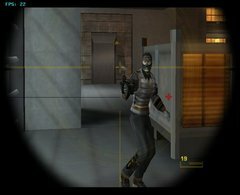 Weapons: Goldeneye Rogue Agent has a wide variety of weaponry. And surprisingly, they are not cookie cutters like the enemies. They have actual and useful purposes. There is a weapon that shoots through walls. There is a weapon that stuns enemies in one shot. (My favorite, so that I can go in for the punch.) There is a weapon that sticks a bomb on someone, which slowly counts down till it explodes. Wonderful! There is a weapon that is only available in multiplayer that I wish they would have included in single player, which is the goblin mine. It is basically a trip mine, but it would have been useful in cornering enemies. (Though enemies don’t really rush you all that often since they like to take long distance pot shots.) The weapon selection is possibly the best thing about Goldeneye: Rogue Agent. Though this alone cannot save the game (except possibly the multiplayer). During the game you can melee punch enemies and take them hostage. I never found this effective, as the enemies seem to shoot around the hostage really well. Furthermore, when you grab people and use them as shields, the slightest throw will kill them. Heck if they even get out of your grasp they die. Elites or regulars, it doesn’t matter, what the? There are places you can throw them into, e-lec-tricity (Gets reminded of School House Rocks Jingle) and acid pools but for what? They die the instant you throw them out of your hands into anything? Therefore, they are dead before they even reach the hazard. Playing through single player, I found the features so heavily promoted to be cheap gimmicks. This game is a Halo 2 Rip-off in features. Duel Wielding, Nice. But in Goldeneye: Rogue Agent? A mixed bag. It gets really complicated to change weapons often, and since you will run out of ammo for your guns and will be changing them a lot. Some weapons need both hands to equip, and this really messes up your weapon setup if you pick up one of those, since you’ll drop any weapons you have equipped. Likely you’ll use up the ammo for the two handed weapon and backtrack to get both weapons that you loved dearly up to that point. That is, till they run out of ammo and you go scrambling to get another awesome combination. Honestly, I like the duel wielding. Despite being a rip-off, it still proved to be fun, but this was due to the fact the weapons were fun. If every gun were only a stronger version of the initial pistol, then the feature would have been wasted, luckily the weapons are varied enough, that the duel wielding is more useful than having to inventory swap to the gun you need, like other shooters have too. Though, you are still limited to two weapons. Now for your powers. These are really stupid to me. You can use some of them to trigger objects but half this game you don't even have to use it to complete your tasks. They are hard to aim, and the only power that redeems itself is the temporary invincibility. The telekinesis never worked as I wanted it. The disable gun rarely seemed to work right, so it was used mostly to activate panels. And the X-ray specs were hardly necessary, as the enemies made themselves known by popping out of places quite readily. Puzzles: You run around killing people and that is basically it to this game. Tiny, if any puzzles, and not much else. These often rely on the long-range activating power I mentioned. Did I also mention the levels are long? And I mean long. It takes probably about 1 hour to 1.5 hours to complete all the mini missions of a level. Because you can't save in-between levels all your work could go to waste in an instant. There are checkpoints, but they are often spaced apart to much so that when you die, you pull out your hair and curse a bit as you have to redo a section over- and over and over. Overall, gameplay was not great. 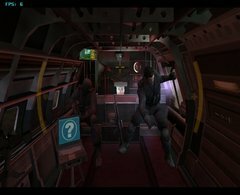 Storyline: In the first level of the game, James Bond, who doesn't evil look like James Bond, gets throw out of the helicopter after it is shot down and is hanging on a ledge. If you get close to James Bond on the ledge the helicopter falls crushing him. If you walk away, it crushes him. If you don't do anything, it crushes Him. If you try and help, well you get the picture. Later MI6 blames you for his holographic death (The whole thing was a simulation, what the?) What did I ever do? In fact, in the whole holographic simulation, if you’re the nicest person ever, not shooting anybody you’re still thrown out of MI6 for being too violent. 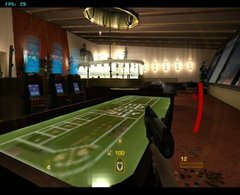 That first level is the last time you see James Bond anywhere in this game. That's right, for a James Bond game he's barely even in it. 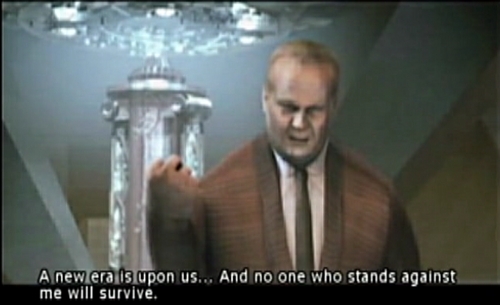 In fact, you won’t even get to fight him, the most disappointing aspect of this game. You should have killed James Bond and taken over the world. Or since all the Evil Villains that James Bond killed now live at the same time period, then this should be an alternate universe with no James Bond AT ALL. Sheesh the storyline fails here. After your expulsion from MI6 you are swiped up by Goldfinger. He' a nice guy. Scaramanga gives you powerups. He's nice. You’re trying to kill Dr. No because he took your good eye in some kind of freak shootout which wasn’t completely explained "It could have easily been more than your eye." So we try to and fail the first time. Later Onatopp tries to kill you on the Dam level. She tranquilizes then molests you then leaves you to then fight her and kill her shortly after. What the heck was the tranquilizing molesting cut scene about?! Oddjob, Goldfinger’s second hand man also tries to kill you on the Dam level and you end up killing him. That is odd because nowhere in the story does it say anything about you hating Oddjob or he hating you. Somewhere online it says he's jealous of you, but where does the game actually tell me that? To make it short and if you don't care about the ending, *SPOILER* you kill Dr. No then Goldfinger betrays you (cause hes evil of course) then you Kill Goldfinger. To show you how thin the plot is; while there were about 7 levels leading up to killing Dr. No, there is just one level where you try and kill Goldfinger. Seems like they wanted to rush this out the door. Then some other junk happens and nothing else makes sense. WHERE were you James Bond?!! After being expelled from MI6, The anti-hero joins with Goldfinger. Together they work to gain the respect of the other villains. This includes taking out a few that don’t see things your way. *Insert Tokyo mission here. *Insert killing Dr. No here. After a few missions of that. Goldfinger has you target his greatest threat to his enterprise. MI6 itself. You and Goldfinger’s stormtroopers rush the headquarters where you meet such historic locations as Q lab. But wait, you eventually make your way to M and kidnap her. Just as James bond reaches you, you and her are extracted by helicopter out the window. Hah hah James Bond! 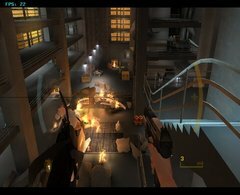 Multiplayer: Rogue Agent: Despite all its flops has a somewhat good multiplier. It takes up most of the second Disk so it BETTER be good. I'm guessing that the game had more of a multiplayer development than a single player one, see terrible aspects above. To tell you the truth, multiplayer is the only redeeming factor of this game. Unfortunately you have to play through single player to get most of the multiplayer content. Considering how bad and tiresome single player becomes, this is torturous. I’ll go into it more in the next section. There are many multiplayer levels to choose from, and you can choose game types like a capture the beacon, the fps staple;deathmatch, elimination etc. Playability is good, and gameplay is fine here, you kill things, which was the point of this game anyway. The Goldengate Bridge, Goldeneye targeting station and other locations make up the exotic locations. Unfortunately most of the given levels are very small in size so you'll often meet up in very limited time spans with your enemies. This keeps the action fierce, though it may be too much for 4 players. With 2 players the levels seemed small. Powers can be used and multiplayer, and supposedly there is a rock paper scissors element to blocking powers. Usually though there isn’t a lot of time to react to the powers once you’re hit, so the blocking element is hard to pull off. Frankly the two useful powers come down to one that stuns other players, and the invincibility one. Despite being another main draw of the game, these felt out of place in multiplayer, and may have been better as special powerups, than a constant technique. Unlocks: A very sloppy design. It takes ALOT of work to unlock anything. If you play on a harder difficulty you get better prizes. I played through the whole game on HARD the first time through (and didn't wish to play through it again) and didn't unlock much except a few doodads in multiplayer. To unlock the good stuff you would have to get a higher score rating on that level. This means you would either have to be very fastidious on how you complete the level, to attain maximum point coverage, or play the game on a harder difficulty to obtain a better multiplayer. If on hard it was near impossible to unlock the better items, how would you do it? By completing the game on 1 life only. (After you beat the game once, you get a one life to live mode.) Darn. 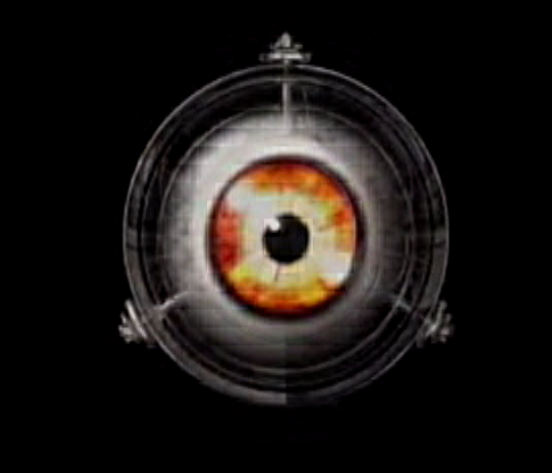 I beat Goldeneye: RA on hard, but died many times. So I played it on 1 life only, and got through about 3 levels. During that short time I unlocked the special content, like good multiplayer material and useless concept art. (To tell you the truth the concept art looked better than the actual game, they left some good designs out.). After getting to the fourth level or so I died. "Ok" I thought, I could just replay that 1.5 hour level and continue to get bonuses. OH NO, not EA they forced you to START Over from the very first level. NOoooo Never again. Conclusion: Looking back on bad events, it never seems as bad as it did when you were suffering through it. So, as per my initial review. Summary: Do not buy this game for its Single Player, nor if you don't like to spend forever unlocking Multiplayer content. Otherwise I recommend getting James Bond: Everything or Nothing or Timesplitters: Future Perfect and not touching this game with a 35 and 1/2 foot pole.